OpenScope MZ is a USB/WiFi oscilloscope with a Waveform Generator and Logic Analyzer. What does that mean? It's a device that you connect to your computer (through WiFi or a USB cable) that allows you to acquire, analyze, visualize, and control signals from circuits, sensors, and other electronic devices. 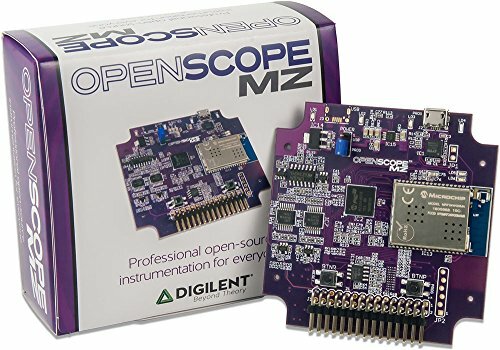 Unlike typical USB instruments, OpenScope MZ can also be programmed to run standalone like an Arduino or Raspberry Pi, but with high-speed precision analog and digital I/O. At the core of the OpenScope MZ is a powerful Microchip PIC32 MZ Processor. This processor has many resources that we took advantage of to enable the functionalities found on OpenScope MZ. If you have any questions about this product by Digilent, contact us by completing and submitting the form below. If you are looking for a specif part number, please include it with your message.